Beauty Instead of Ashes! Out with the Old! In with the New! “Instead of” are powerful words repeated throughout scripture. As we end one year and prepare to enter a new one, may the truth of these words resonate. From that day on everything changed! The waves may still roll, but Christ is present! He is with us! God is willing and able to grant an excellent exchange for whatever burden we are carrying. Even a child recognizes a good trade when they see one! However, there is one condition! 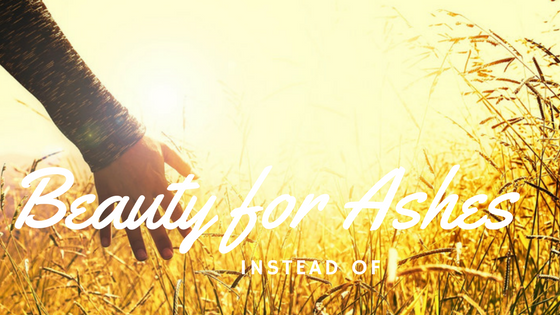 God is asking us to give Him our ashes, mourning and despair. Are we willing to let them go? When I yielded my life to the Lordship of Jesus Christ, I had only brokenness to offer Him. My track record had produced failure and disappointment in multiplied measure. Suicidal thoughts and depression had left me a broken shell, without hope. But Christ came! Everything changed – some pieces radically and instantly, others slowly and progressively. He continues to invite me to yield to Him things He never intends me to carry. His offer to replace them with something incredible still stands. Thorn bushes are rough and dangerous; their pointed barbs sink deep. Jesus bore such a painful crown pressed firmly in His brow. Applauded one hour and disdained the next, His beauty and deity were unrecognizable to most earthly eyes. Junipers in the Middle East are tall willowy bushes growing in desert places. Travelers often find shelter under their bending boughs. The myrtle bares intensely aromatic white blossoms delicately edged in the colour of royalty, purple. or paralyzing pain of loss. Jesus traded an authentic crown for a mocking one. Today, he invites us to exchange every unnecessary weight for the authentic beauty He offers. It is a good trade! A few months ago, a friend was struggling to personally receive God’s “instead of.” All her short life, she had been juggled from house to house – unwanted and undervalued. We set a garbage can in the middle of the room and began to toss crumpled bits of paper into it. Each piece represented an image, thought or message that had been embedded into her belief system shaping how she now saw herself. When the mark was missed, we walked over and picked up the wad of paper and made sure it landed deep into the metal bucket. I had several wads of my own to toss! Once tossed, we gave each painful wound into the hands of the only One who can fully erase their weight. Once the trade is made, no dumpster diving! It is not just our stuff that God is perfectly able to trade. God wants to release us from everything anyone else has done against us. God’s “instead of” applies equally to both! God is a master of transformation – a divine recycling! Out with the old and in with the new! Though once my mind was racked with dark thoughts of death, now I help others find the light of hope. This is not unusual! God delights in taking what was once our greatest infliction and turning it into a powerful tool of redemption. Those once bound by chains of chemical addiction now show others the way through the tangle to beautiful fulfilled lives. People once tormented in a variety of ways now lead others into places of health and wholeness. As a matter of fact, your place of greatest struggle is probably the very area God has destined to use you to bring freedom for others and glory to Him. We cannot always fully see what God is working out. His “instead of” is always greater and better than the troubles we are are trading in. Whatever we are going through is working! It is working for His glory! It is working the best in us and for us! God will receive the glory and renown He is worthy of, as we are willing to exchange what we are holding on to. Before this year ends, trade it in! I am excited to see what new thing God has for each of us through Christ! Another read: Do it Again Lord! Renew! Restore! Revive! Sign up here to join the greatest followers ever! ← Creating a Culture of Honour – Honour God! Honour All!